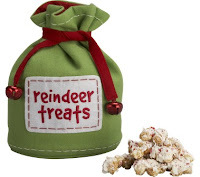 While shopping at Crate & Barrel the other day I stumbled upon the cutest holiday candy bag. It was a little too pricey for my budget, so I set out to duplicate it for less. With some felt and a little bit of work I was able to create something pretty close to the original. • Fold the pieces in half. Sew along the long open end (like you would a pillow). Do not sew the top or bottom closed! • Measure the bottom of the bag. Using a circle template cut out a circle with that diameter (leaving a ½” seam allowance). Use a fabric pen to trace the circle for guidance. • At this point I found it easiest to draw a line on the inside of the bag ¼” from the bottom which can then be aligned with the outline of the circle. 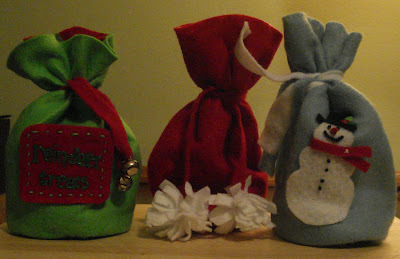 • Pin the circle to the bottom of the bag, aligning the two markings. Note the markings will not be touching, you will have to visually line them up. Sew together. • Turn the bag inside out and embellish as you desire!